Members were reminded of the need to be vigilant to stand aside from decision making when a conflict arises between their role as a member and any private or other external interest they might have. Specifically members are asked to identify any new interests they have not previously disclosed, an interest that might be considered as a conflict of interest with a matter on the agenda. a) confirm the ordinary minutes of its meeting, held on Thursday, 13 December 2018, including the confidential section, as a true and correct. At the close of the agenda no requests for leave of absence had been received. At the close of the agenda no requests for acknowledgements had been received. 1. To receive a deputation from Barbara Adler on behalf of Candia Road Make it Safe to present the Candia Road petition. 1. Following a presentation to the Board on 13 December 2018 on the Candia Road safety issues, Barbara Adler will table a petition to illustrate the community’s concern regarding the safety issues affecting Candia Road. a) receive the Candia Road petition and thank Barbara Adler on behalf of Candia Road Make It Safe for her attendance. 1. Tom Austen will present a petition and seeks the Board’s support to re-open Spragg Bush – Henderson Valley (West). a) receive the petition to re-open Spragg Bush and thank Tom Austen, on behalf of the Spragg Bush residents, for his attendance. Standing Order 7.7 provides for deputations. Those applying for deputations are required to give seven working days notice of subject matter and applications are approved by the Chairperson of the Waitākere Ranges Local Board. This means that details relating to deputations can be included in the published agenda. Total speaking time per deputation is ten minutes or as resolved by the meeting. At the close of the agenda no requests for deputations had been received. A period of time (approximately 30 minutes) is set aside for members of the public to address the meeting on matters within its delegated authority. A maximum of 3 minutes per item is allowed, following which there may be questions from members. At the close of the agenda no requests for public forum had been received. a) thank Waitākere Ward Councillors Linda Cooper and Penny Hulse for their update. 1. 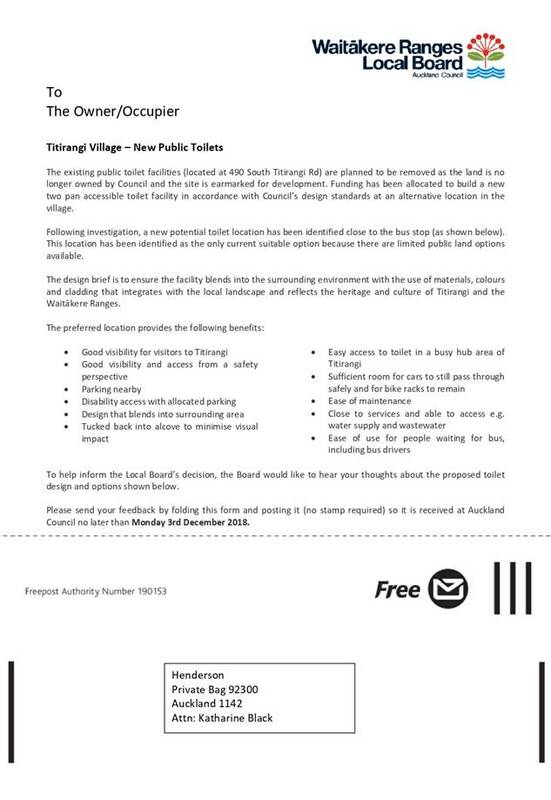 To seek approval for the concept design and location for a new public toilet in Titirangi village. 2. The existing public toilets located at 490 South Titirangi Road, Titirangi are due to be demolished as they are on land no longer owned by the Council and the site is subject to a consented commercial development. 3. A concept design has been developed for the proposed new public toilets adjacent to 400 Titirangi Road (refer Attachment A). Two other locations were also previously considered this site has been identified as the best feasible location given there are limited public land options available and constraints around services connections, furthermore this site also meets toilet design guidelines and Crime Prevention through Environmental Design (CEPTD) standards. 4. The proposed concept design is a Permaloo two pan facility including an all accessible toilet. It has been designed to fit within the site constraints while also blending in with the surrounding environment and aligning with the characteristics of Titirangi Village. 5. 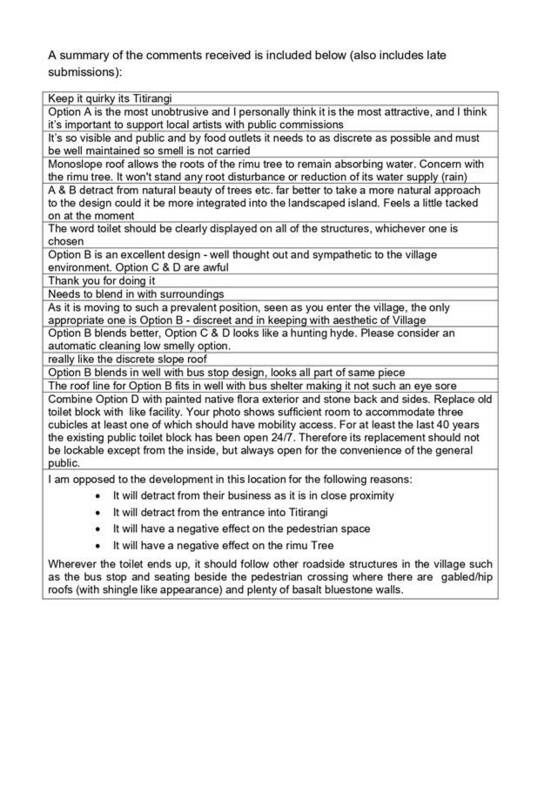 Consultation was undertaken with the Titirangi Village community and other key stakeholders regarding the preferred location and four concept design options that were proposed for feedback (refer Attachment C). Feedback received on the four options identified Option B (Artistic painted native flora exterior with timber shingle roof) as the respondents preferred option. 6. Asset based funding of $298,378 for FY2018/2019 and $100,000 for FY2019/20 is identified in the Waitākere Ranges Local Board Community Facilities Work Programme to implement the concept design.. The funding identified is considered to be sufficient. 7. Following approval by the Waitākere Ranges Local Board, the concept can be progressed to the detailed design stage. Physical works are planned to be carried out in mid-2019, however this is subject to obtaining of consents, landowner and utility provider approvals. b) note that a) is subject to obtaining consent, landowner and utility approvals. 9. The objectives set out in the Waitākere Ranges Local Board Plan are to ensure that urban centres, open spaces and community facilities are equipped with the right facilities to meet local needs and to cater for future growth. 10. Council’s public toilet guidelines require toilets to be provided in key destination areas such as town centres to meet required demand and service outcomes. 11. Budget has been allocated to renew the current building with a new two pan accessible toilet facility in accordance with Council’s design standards at an alternative location in Titirangi Village. 12. Following an investigation, a new potential toilet location has been identified close to the bus stop in the road reserve outside 400 Titirangi Road. 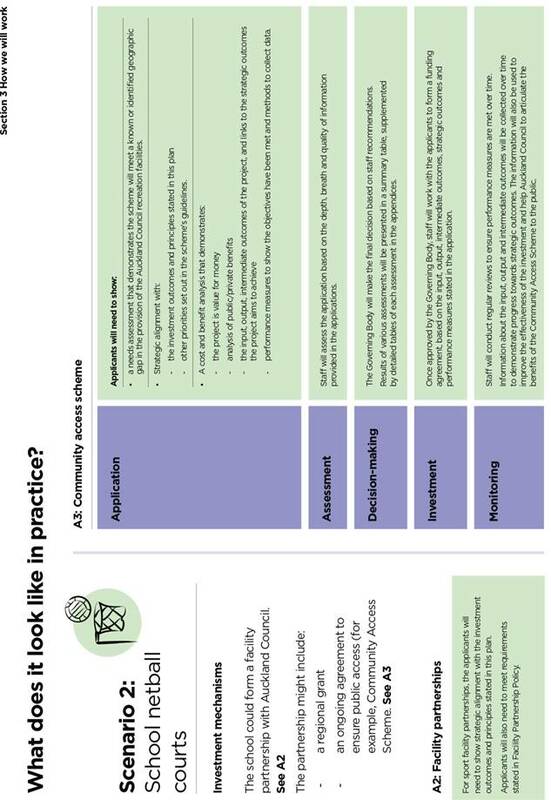 Although two other options were considered (refer to Attachment B), this location has been identified as the only current suitable option because there are limited public land options available and constraints around services connections. 13. Funding of $298,378 for FY2018/2019 and $100,000 for FY2019/20 is identified in the Waitākere Ranges Local Board Community Facilities Work Programme to implement the concept design as presented in Attachment A. 14. The design brief in accordance with “The Draft Waitākere Ranges Local Park Design Guidelines”- is to ensure the facility blends into the surrounding environment with the use of materials, colours and cladding that integrates with the local landscape and reflects the heritage and culture of Titirangi and the Waitākere Ranges. 15. A number of workshops were undertaken with the Local Board in the second half of 2018 to discuss the design and consultation process. Consultation with the Titirangi Village community and key stakeholders was also carried out in late 2018. 16. Attachment A shows the concept design developed for the new toilet block at Titirangi Village, including the preferred location. 18. The proposed concept design is a Permaloo two pan facility including an all accessible toilet. It has been designed to fit within the site constraints while also blending in with the surrounding environment and aligning with the characteristics of Titirangi Village. 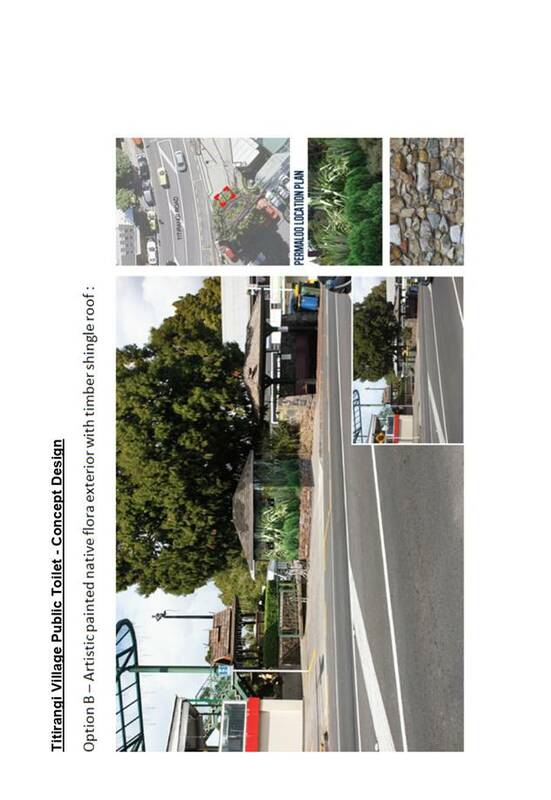 This includes the use of a timber shingle roof to match the bus stop and incorporating the use of natural stone and using a native painted artwork to blend in with the rimu tree and ,match the existing planted stone wall. 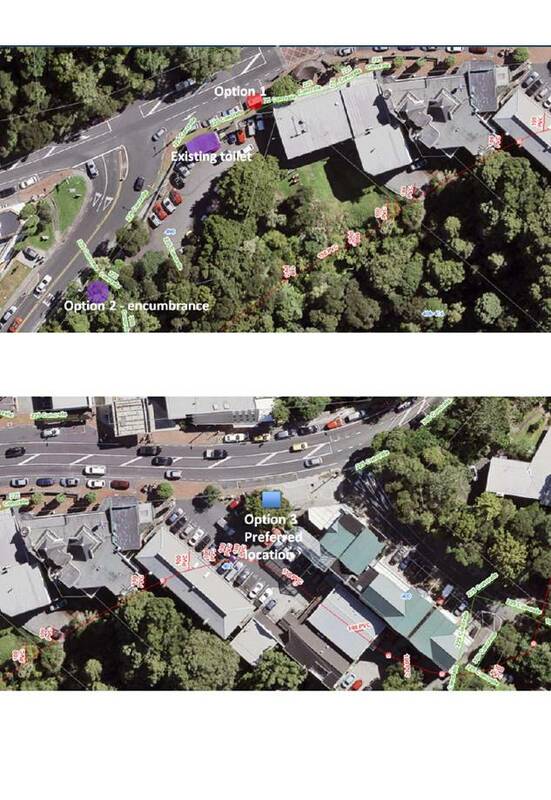 Option 3: Outside 400 Titirangi Road (current preferred location). 20. 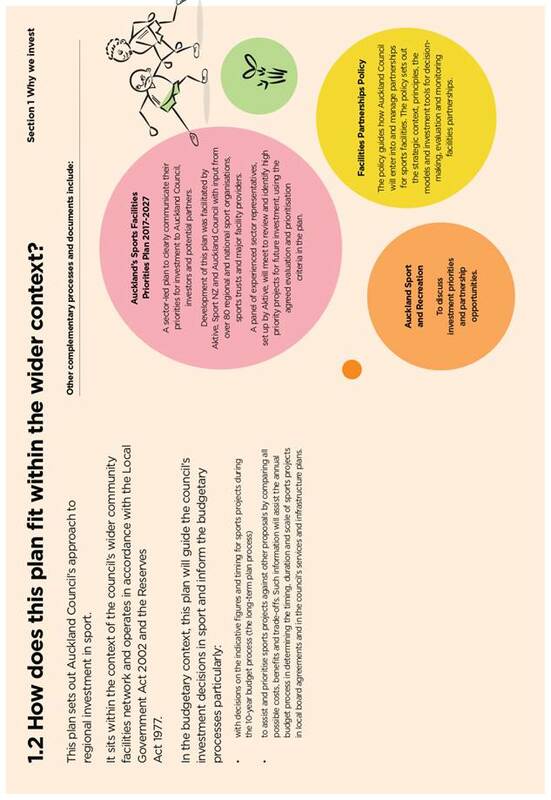 Option 1 was investigated as a potential location in 2017 a design was undertaken but was unsuccessful in gaining consent approval due to complications arising from being unable to secure an affordable and feasible waste water connection to the toilet, which was not supported by Watercare. 21. Option 2 - The encumbrance (which remains valid today) recognised the Council’s right to occupy 18 carparks on the land for public use and to build public toilets on a portion of the land. This site is along the south western boundary and adjoining South Titirangi Road as per the location map. 22. 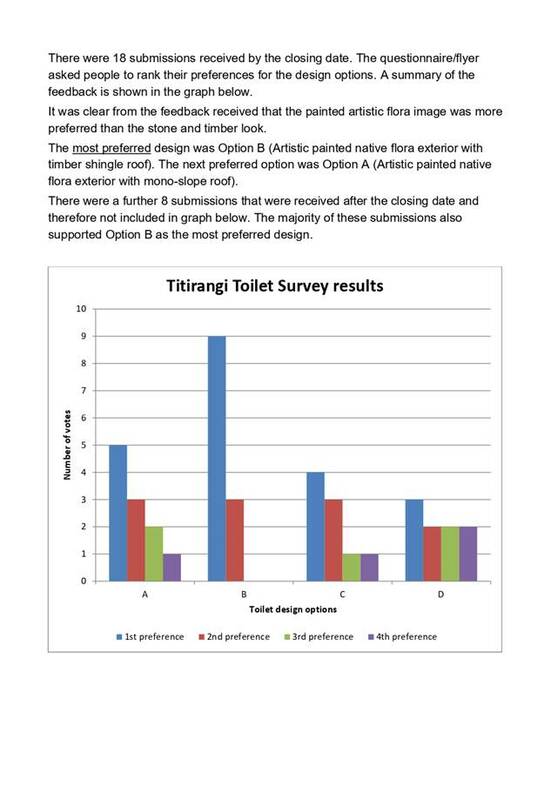 Consideration of the pros and cons including the cost implications of the options has identified Option 3 as the preferred location for a toilet in Titirangi Village and a concept plan was developed based on this. 23. 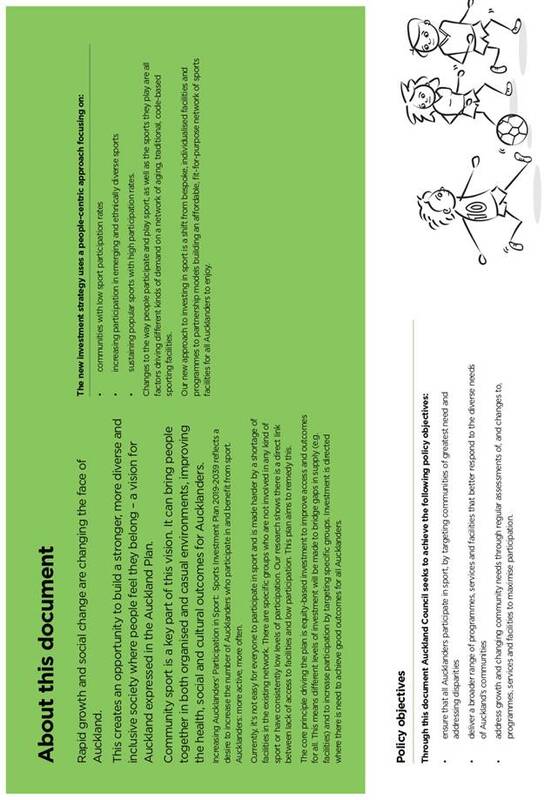 An information flyer/survey as shown in Attachment C, was hand delivered to all the businesses and residents located within the Titirangi Village Town Centre area (approx. 100 flyers). This flyer was also mailed out to any ratepayers with an alternative address. In addition, the flyer was e-mailed to a few key stakeholder groups including the Titirangi Residents and Ratepayers Group. The submission period closed on the 3rd of December 2018. 24. There were 18 submissions received by the due date. 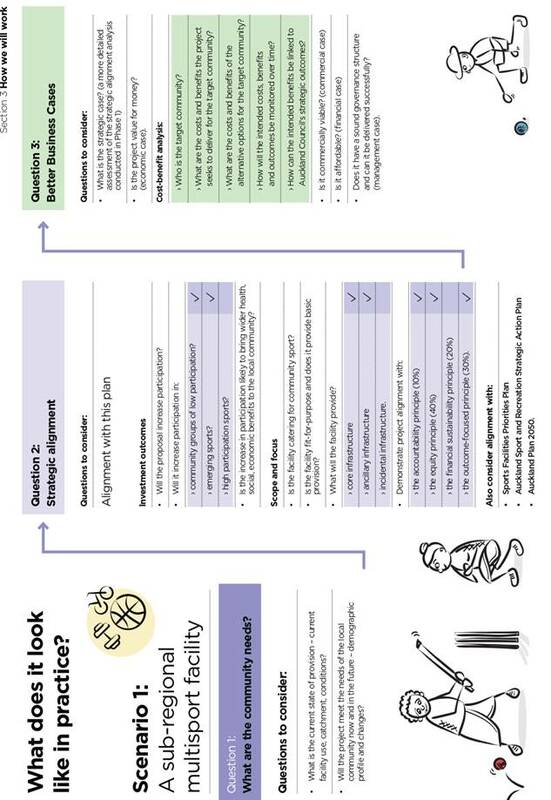 The flyer asked people to rank their preferences for the toilet design options, shown in Attachment C A summary of the feedback is shown in the graph in Attachment D.
25. It was clear from the feedback received that the painted artistic flora image was more preferred than the stone and timber look. From the feedback below the most preferred design was Option B (Artistic painted native flora exterior with timber shingle roof). The next preferred option was Option A (Artistic painted native flora exterior with mono-slope roof). 26. There were a further 8 submissions that were received after the closing date and therefore not included in attached graph. 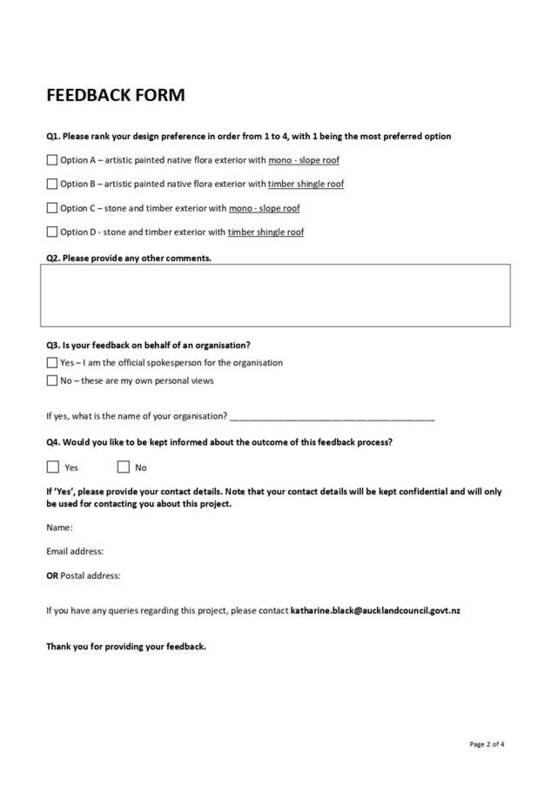 However it should be noted that the majority of these submissions also supported Option B as the most preferred design. 27. The Titirangi Residents and Ratepayers Group supported Option B as the preferred option. 28. A couple of people raised issues regarding the protected rimu tree. A tree consultancy was engaged to prepare an arboriculture assessment on the proposal to construct the toilet partly within the dripline of the rimu tree. The rimu tree is approximately 12m in height and the overall condition of the rimu tree is good. The root architecture of the tree is modified as it is located within the raised planter pit (stone retaining wall). 29. It has been concluded that excavations required to form the foundation for the toilet block is unlikely to encounter root activity in front of the lower stone retaining wall. There will be no requirement to break into any of the stone walls. For the proposed new toilet block, the stormwater, water and power services are not directed towards the tree and not expected to cause any issues to the tree. The waste water line is proposed to be directionally drilled and is unlikely to damage the root structure given the alignment and depth of the proposed pipe. 30. The preferred toilet design (with the shingle roof) is not expected to impact the water supply/rain to the tree. The roof will have a small downpipe to collect stormwater and discharge of this out to the kerb system. Rain water falling on the toilet will be going to the same place as it does now as that existing slab falls to the kerb. Also the toilet is being built in front of the stone wall so not a change there either (apart from loss of the seat). Any works are subject to obtain consent approval and there will be an arborist supervising the works. · It will have a negative effect on the rimu tree. 32. This submitter also said wherever the toilet ends up; it should follow other roadside structures in the village such as the bus stop and seating beside the pedestrian crossing where there are gabled/hip roofs (with shingle like appearance) and plenty of basalt bluestone walls. 33. A summary of the public comments received is included at the end of Attachment D it also includes the comments of the late submissions. Ngā whakaaweawe ā-rohe me ngā tirohanga a te poari ā-rohe / Local impacts and local board views34. A workshop was held with the Local Board in late September 2018 to provide background to the project along with a status update and an outline of previous location options investigated. There was some preliminary design options proposed and feedback from this workshop was incorporated into the design process. 35. The Local Board wanted to ensure the new facility would blend into the surrounding environment with the use of materials, colours and cladding that integrates with the local landscape and reflects the heritage and culture of Titirangi and the Waitākere Ranges. 36. A further workshop was held with the Local Board in early November 2018, where four concept design options were presented to the board for review and consideration. 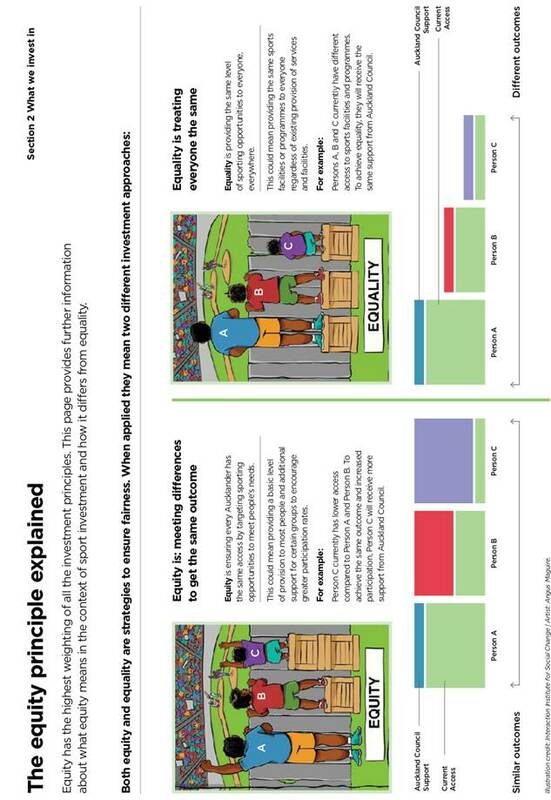 The Local Board requested public consultation on all four options, as shown in Attachment C.
37. A final workshop was held with the Local Board in December 2018, to discuss the findings of the public feedback received. 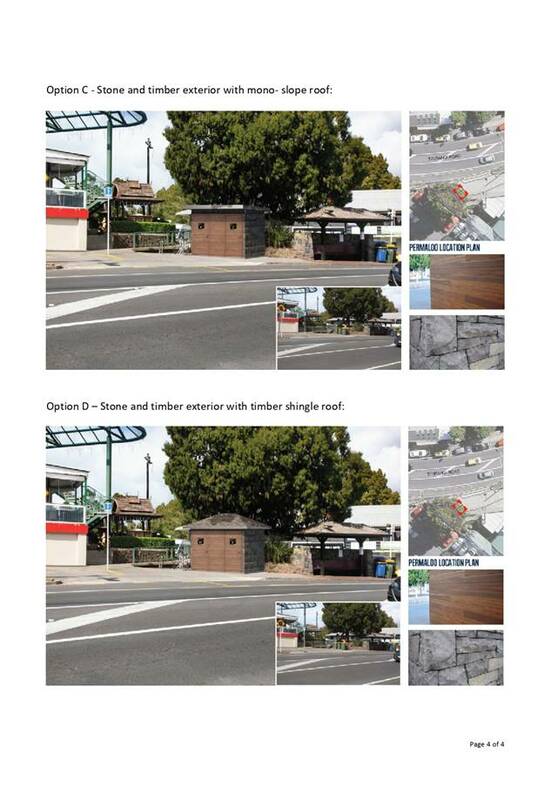 Feedback collated from consultation options showed that Option B was the most preferred (Option B – artistic painted native flora exterior with timber shingle roof) and the Local Board were supportive of this option. 38. As the toilet is proposed to be located in road reserve, engagement and advice has been sought from Auckland Transport in relation to this. Approval in principle has been obtained from Auckland Transport for the location of the toilet facility as shown in the attached concept plan. Discussions have also been undertaken with Watercare in relation to the feasibility of waste water connections. 39. 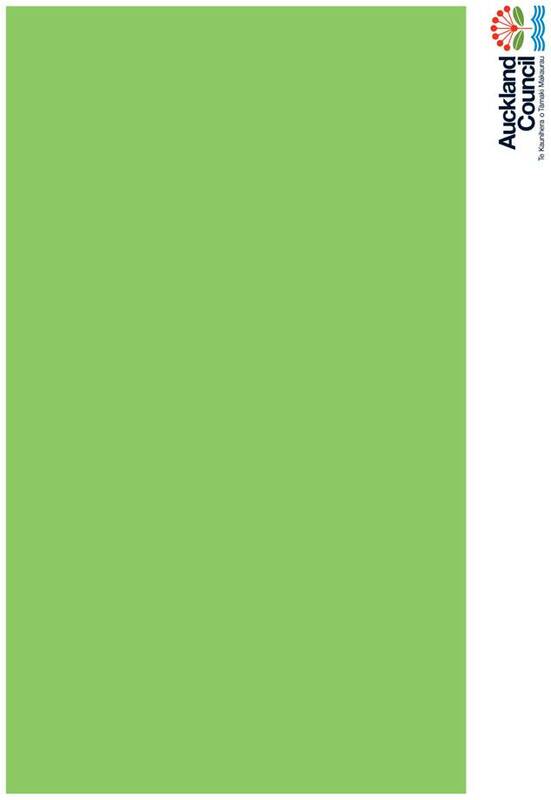 Council staff from both the Community Services and Community Facilities teams was engaged to form the advice in this report. 40. A workshop was held with the Local Board in late September 2018 to provide background to the project along with a status update and an outline of previous location options investigated. There was some preliminary design options proposed and feedback from this workshop was incorporated into the design process. 41. The Local Board wanted to ensure the new facility would blend into the surrounding environment with the use of materials, colours and cladding that integrates with the local landscape and reflects the heritage and culture of Titirangi and the Waitākere Ranges. 42. A further workshop was held with the Local Board in early November 2018, where four concept design options were presented to the board for review and consideration. 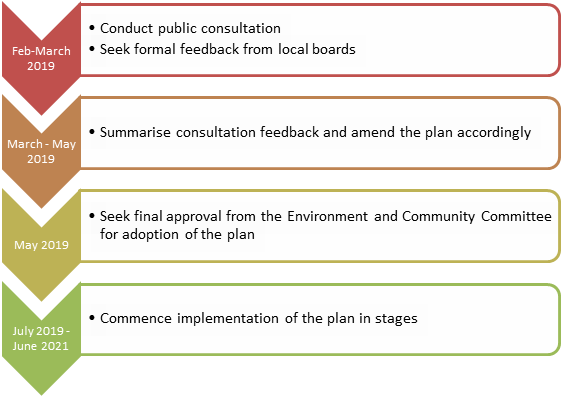 The Local Board requested public consultation on all four options, as shown in Attachment C.
43. A final workshop was held with the Local Board in December 2018, to discuss the findings of the public feedback received. 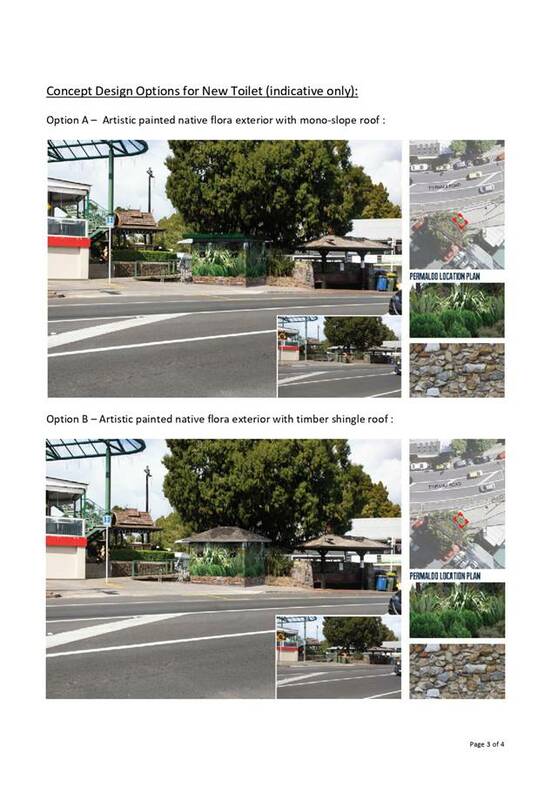 Feedback collated from consultation options showed that Option B was the most preferred (Option B – artistic painted native flora exterior with timber shingle roof) and the Local Board were supportive of this option. 44. Auckland Council is committed to meeting its responsibilities under Te Tiriti o Waitangi and its broader legal obligations to Māori. The council recognises these responsibilities are distinct from the Crown’s Treaty obligations and fall within a local government Tāmaki Makaurau context. 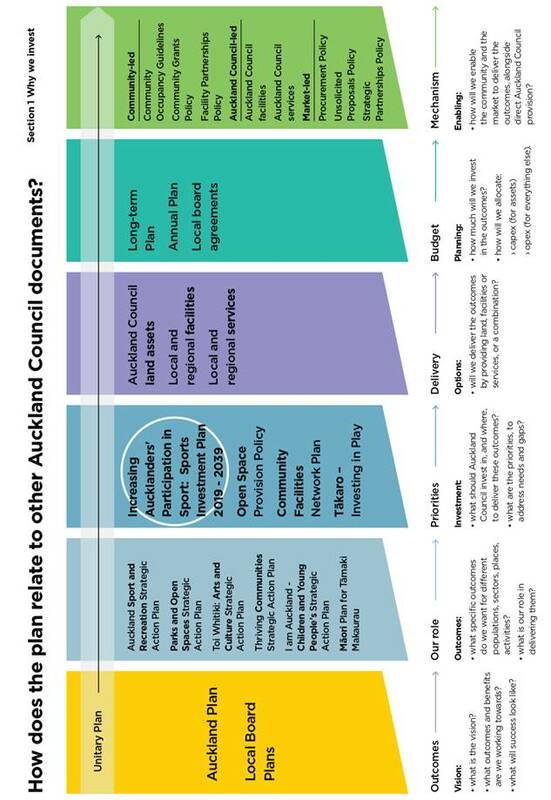 These commitments are articulated in the council’s key strategic planning documents: the Auckland Plan, the 2015-2025 Long-term Plan, the Unitary Plan and local board plans. 45. Engagement with Te Kawerau a Maki was undertaken by way of an email to seek any expression of interest in the project. At the time of writing this report no feedback had been received. An update regarding any feedback received will be provided at the business meeting. 46. Regional funding was endorsed to replace the toilet when the governing body decision to approve the sale of the associated land parcel was made. 48. The funding identified is considered to be sufficient for the delivery of the concept design as presented in Attachment A. 49. More accurate cost details will be identified during the progression of the project through detailed design and procurement. As a result, the budget required may need to be reviewed as more detailed costs are received. 50. There is a risk that Titirangi Village could be without a permanent public toilet facility over the short term subject to timing should the existing toilets need to be removed to make way for the commercial development of the now privately own land. However, this can be managed by providing temporary portaloos (or similar) as an interim measure during the time from the existing toilet being removed and the new facility being constructed and fully operational. 51. Following approval by the Waitākere Ranges Local Board, the concept plan can be progressed to the detailed design stage. Physical works are planned to be carried out in mid-2019, however this is subject to obtaining of consents, landowner and utility approvals. 52. There may be a requirement to provide temporary portaloos to service Titirangi Village as an interim measure during the time from the existing toilet being removed and the new one being constructed and fully operational. 1. 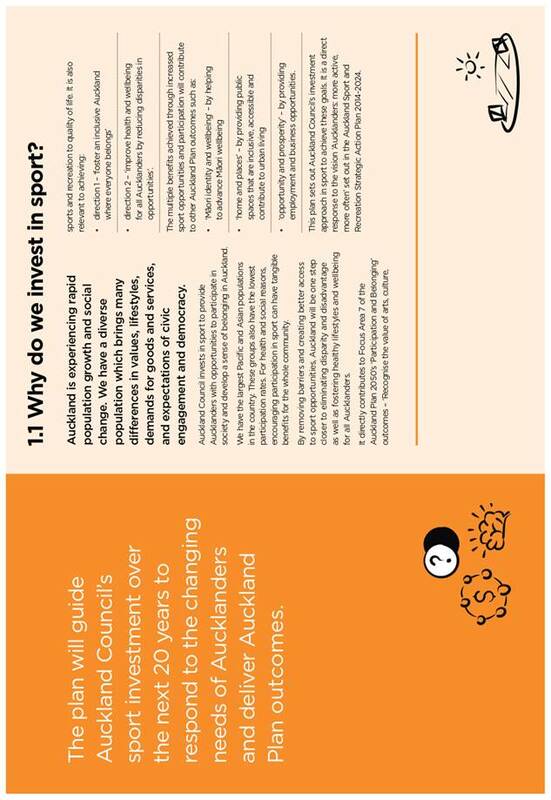 To seek local board feedback on the draft Increasing Aucklanders’ participation in sport: Investment Plan 2019-2039. 2. 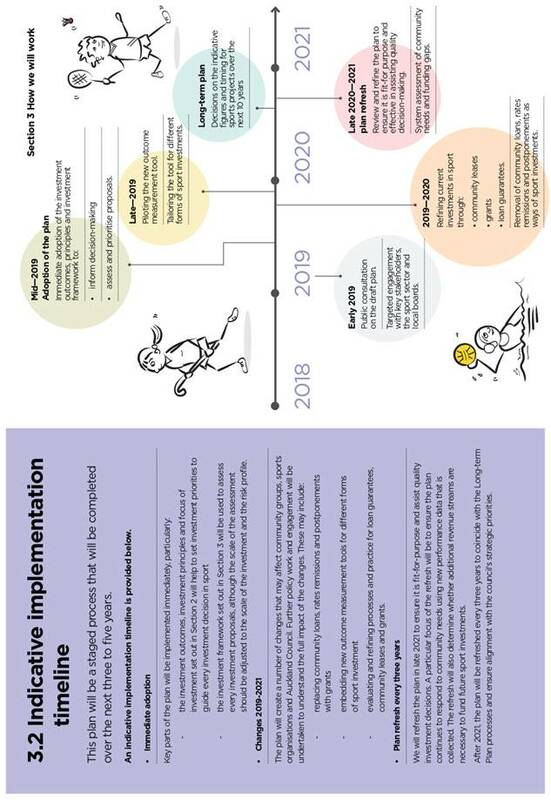 To respond to population growth and demographic change, Auckland Council has developed a plan for how it will invest in sport for the next 20 years. 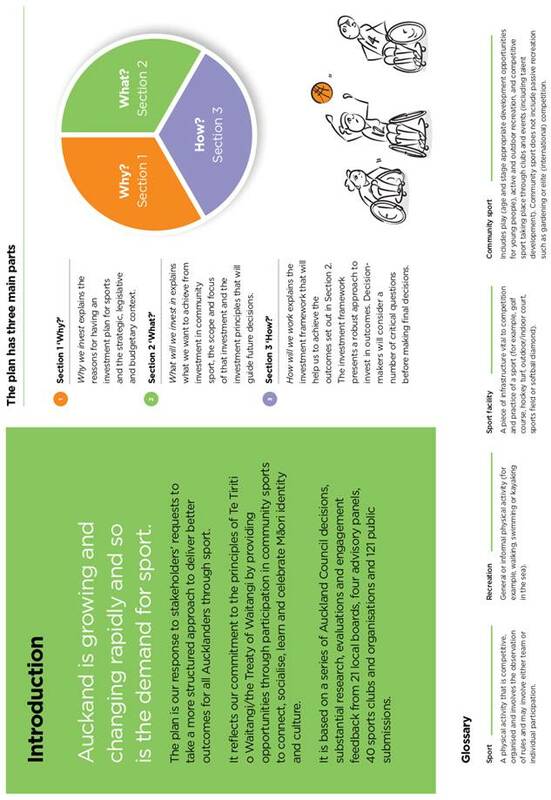 · address population growth and changing sport preferences through regular assessments of, and changes to, programmes, services and facilities to maximise participation. 4. The draft plan was endorsed by the Environment and Community Committee in December 2018 for public consultation [CP2018/07771]. 5. This report invites local boards to formally indicate their support for the draft plan and any additional feedback on the draft plan they would like the committee to consider prior to the plan’s adoption. 6. Staff have engaged with local boards informally at various stages throughout the development of the plan. Local boards members’ views and concerns have helped shape the key components of the plan. 7. A summary of consultation feedback will be prepared for the Environment and Community Committee for consideration. 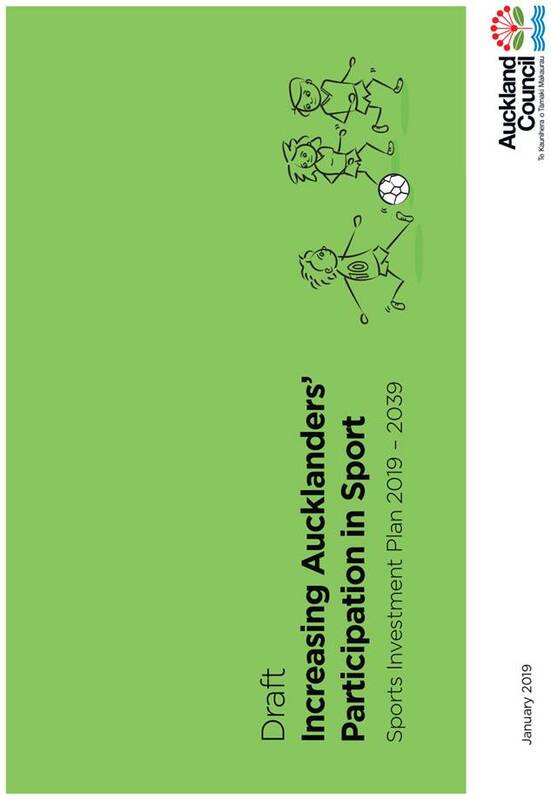 Final decision on the adoption of the plan will be sought in May 2019.
a) endorse the draft Increasing Aucklanders’ participation in sport: Investment Plan 2019-2039 and provide any additional feedback for consideration of the Environment and Community Committee. 8. Auckland is experiencing rapid population growth and social change. Our diverse communities have different preferences and requirements for sport and recreation activities. 9. 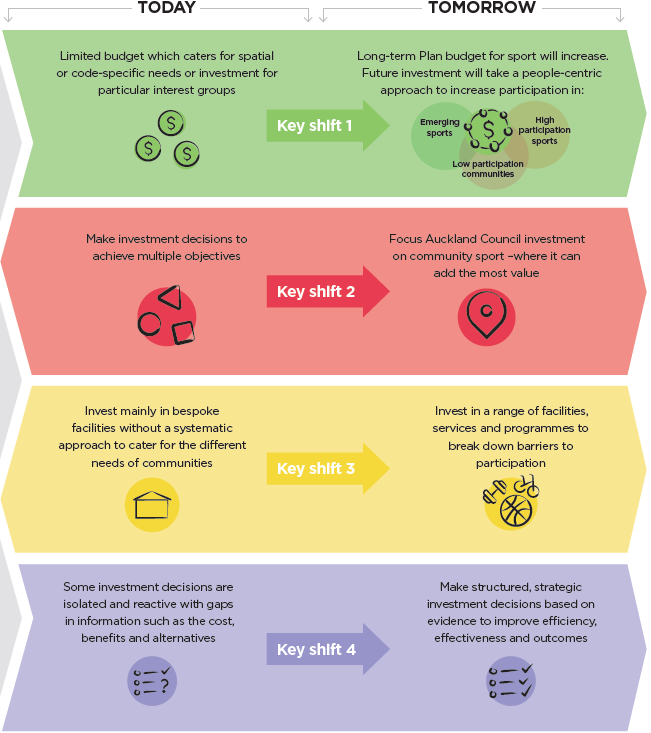 The draft Increasing Aucklanders’ participation in sport: Investment Plan 2019-2039 is the council’s response to these changes. It sets out a new approach to regional investment in sports facilities, programmes and services for Aucklanders over the next 20 years. · address population growth and changing sport preferences through regular assessments of, and changes to, programmes, services and facilities. 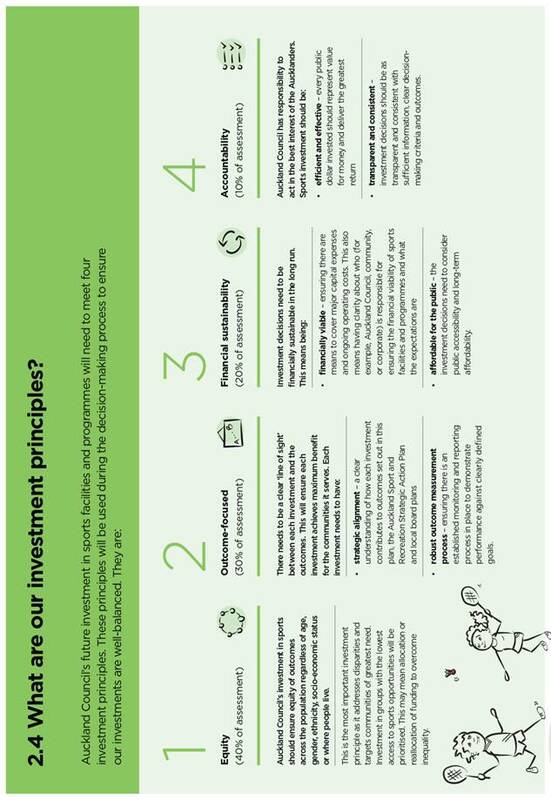 · Section one: ‘Why we invest’ explains the reasons for having an investment plan and the strategic context. 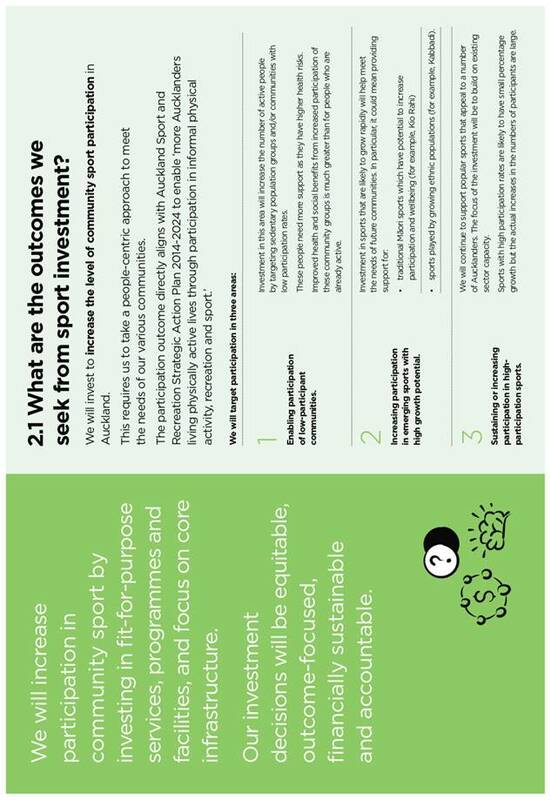 · Section two: ‘What we invest in’ explains the outcomes sought from the council’s sports investment, the scope and focus of that investment and the principles that will guide future investment decisions. 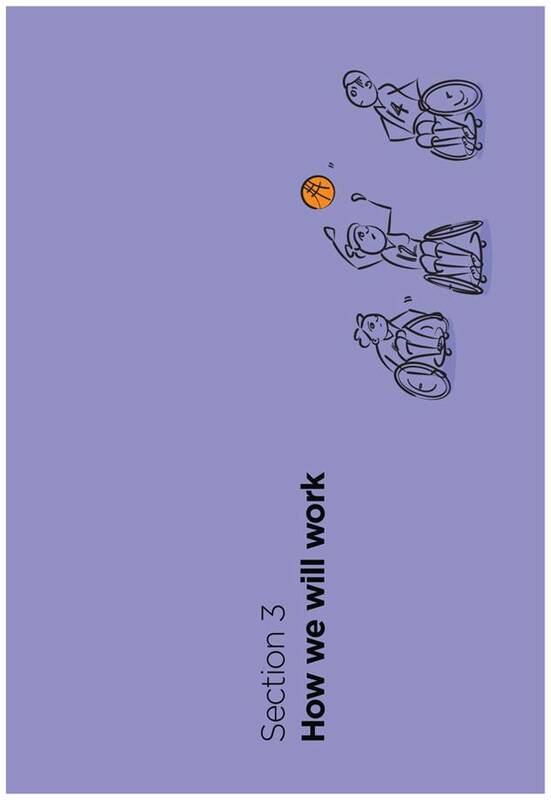 · Section three: ‘How we will work’ explains the investment framework that will be adopted to achieve the outcomes. 12. The development of the draft plan involved several Governing Body decisions, local board engagement, public consultation and research. 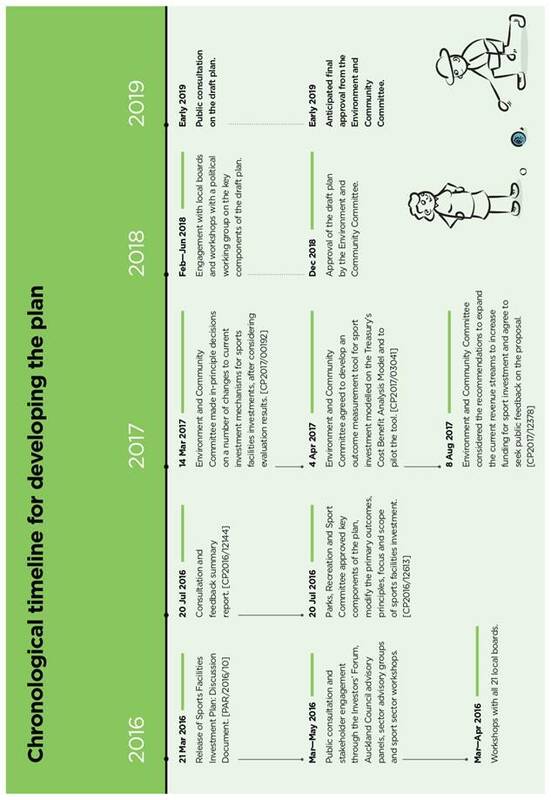 The attached draft plan provides the chronological timeline for developing the plan. 13. 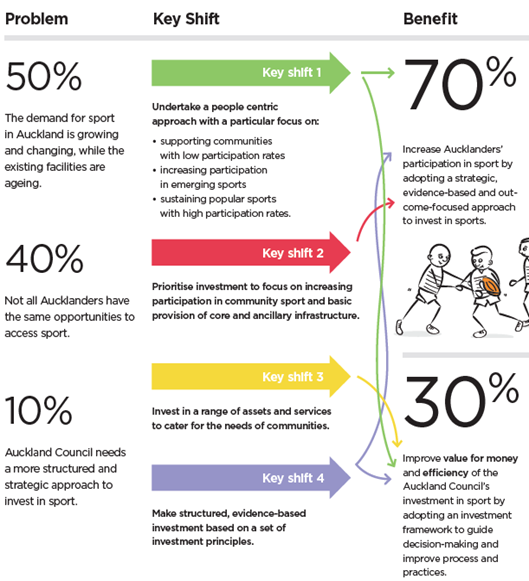 Sport is one of the key areas the council invests in to deliver on the ‘Belonging and Participation’ outcome in Auckland Plan 2050. 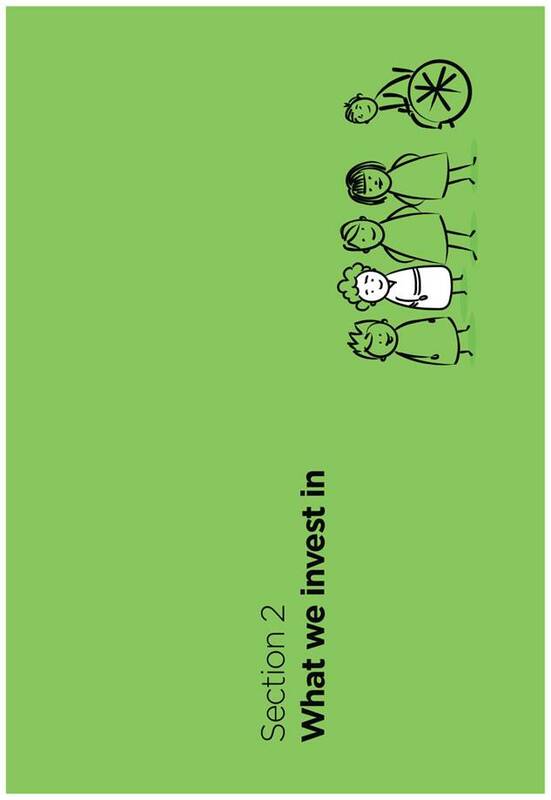 · Direction 2 – Improve health and wellbeing for all Aucklanders by reducing disparities in opportunities. 15. The multiple benefits delivered to local communities through increased sport participation will also contribute directly to the health, social and economic outcomes for Aucklanders as set out in the local board plans. There will be more fit-for-purpose facilities and programmes to keep them actively involved in sport. Currently there are limited opportunities to play, but in the future, there will be more fit-for-purpose facilities and programmes that cater to new and emerging sports. Auckland Council will create more opportunities and make it easier for them to take up sport. 17. A key step towards increasing sport participation rates in these targeted groups is through addressing disparities. 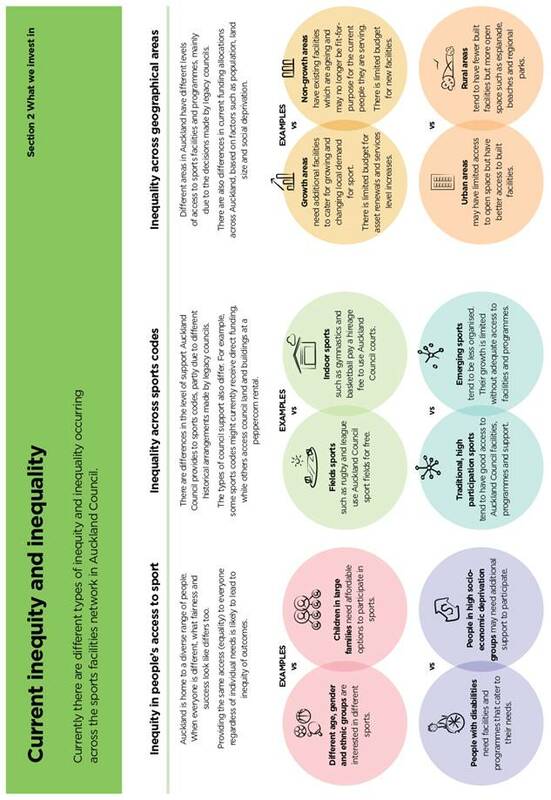 · Equity (40 per cent of assessment) – Sport investment should ensure equity of outcomes across the population regardless of age, gender, ethnicity, socio-economic status or where people live. 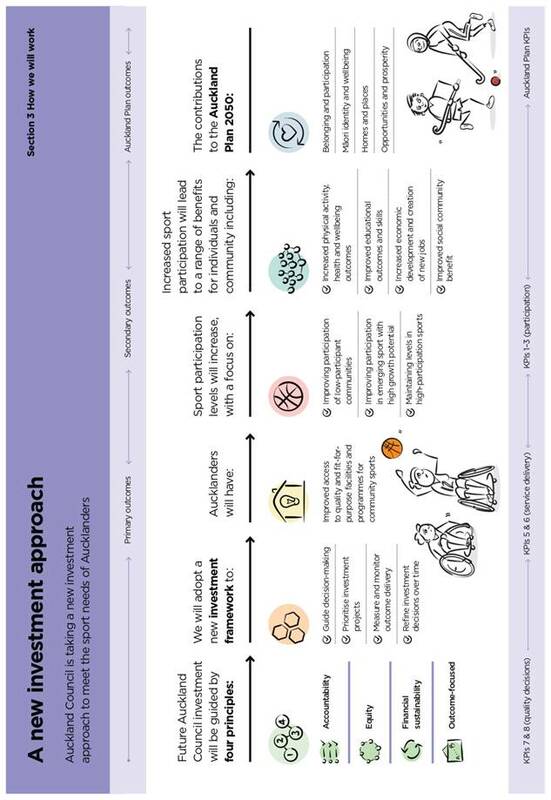 · Outcome-focused (30 per cent) – There needs to be a clear line of sight between each investment and the outcomes it delivers. 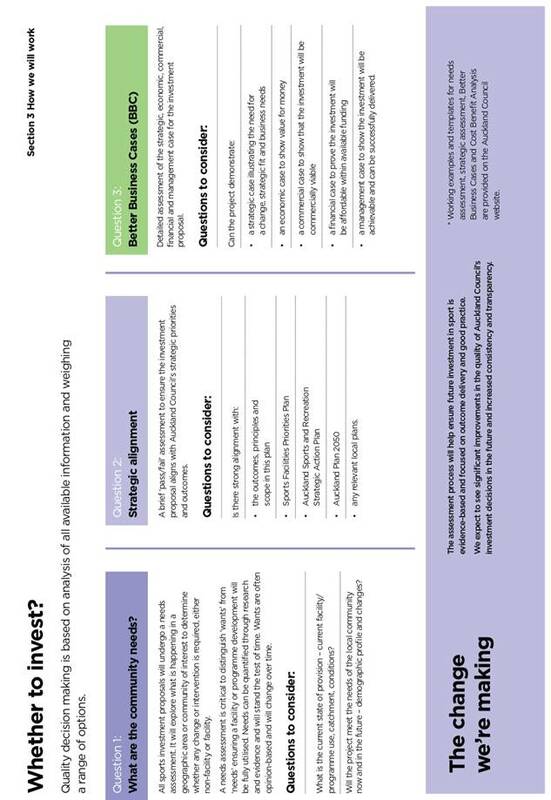 · Financial sustainability (30 per cent) – Investment decisions need to be financially sustainable for council and sports organisations. · Accountability (10 per cent) – Auckland Council has responsibility to act in the best interests of Auckland. 19. 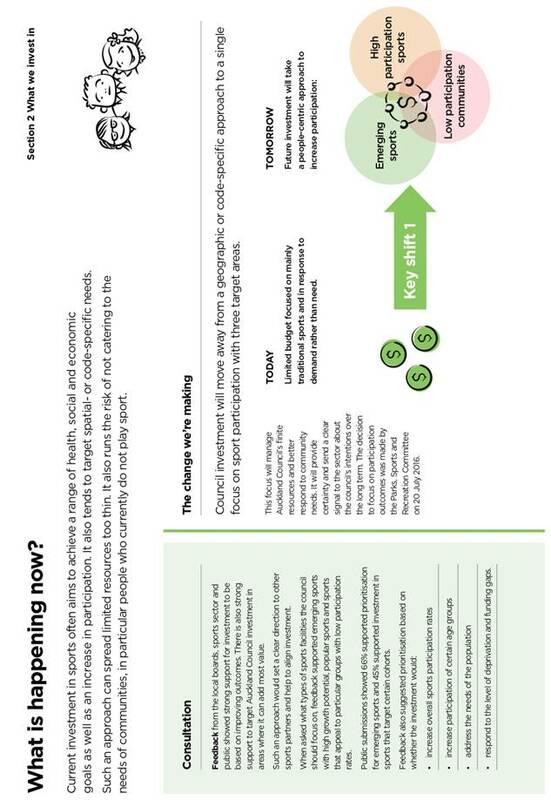 The draft plan sets out four key shifts in our approach as illustrated in Figure 1 below. 20. 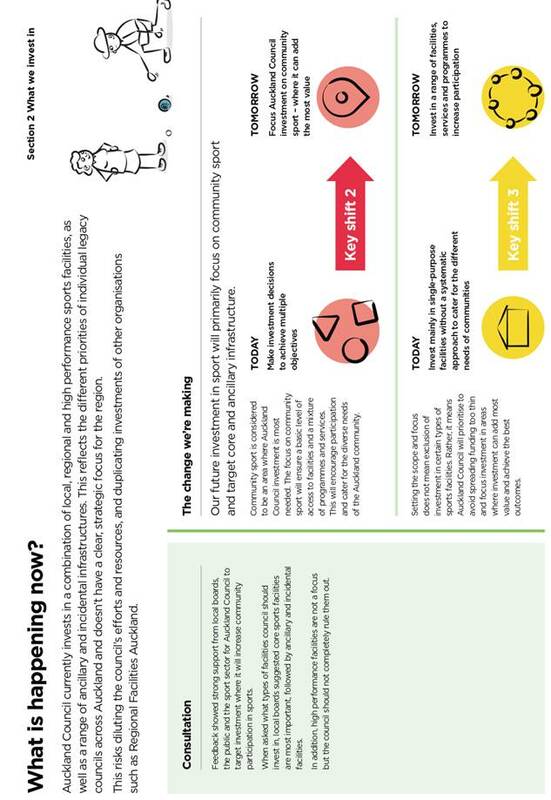 Figure 2 below explains the reasons for these key shifts, the problems they will tackle and the benefits for Aucklanders. 21. The plan will ensure robust, evidence-based decision-making and ongoing monitoring of benefits delivered to our communities. 22. Performance data will be collected to measure the return on investment. This will be shared with investors and ratepayers. 23. Once adopted, the plan will have a direct impact on council’s internal investment processes, particularly regarding how future projects will be assessed and monitored. 24. Parks, Sport and Recreation staff have been engaged throughout the development of the draft plan. 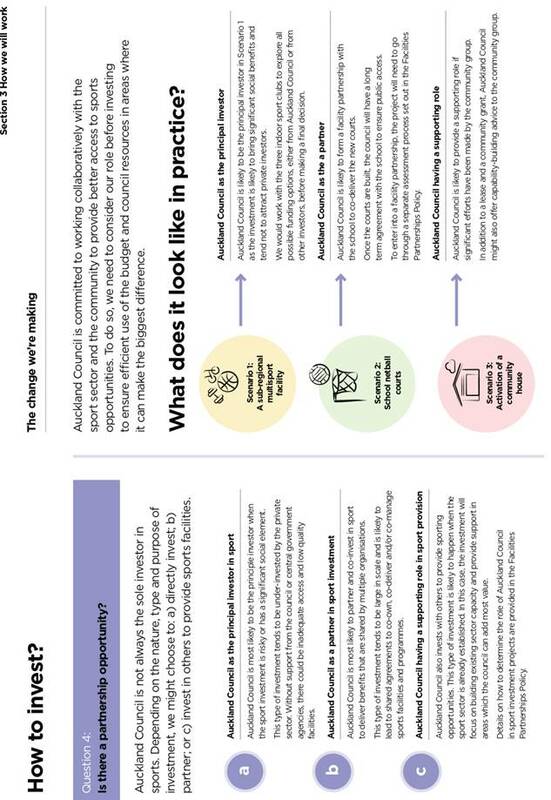 Their feedback, particularly regarding how the proposed changes can be adopted in practice, has helped shape the investment framework and the scenarios in the draft plan. 25. Parks, Sport and Recreation staff have also facilitated the council’s engagement with the sport sector through Aktive, the council’s strategic partner for sport. The general feedback is supportive of the new investment approach to improve participation and deliver better outcomes for Aucklanders. · work together to support facilities that benefit several local board areas. 27. Staff have engaged with local boards informally at various stages throughout the development of the draft plan. Local boards members’ views and concerns have helped shape the key components of the plan. 28. Staff met with local boards between February and April 2018 and sought informal feedback on the key components of the plan. 29. 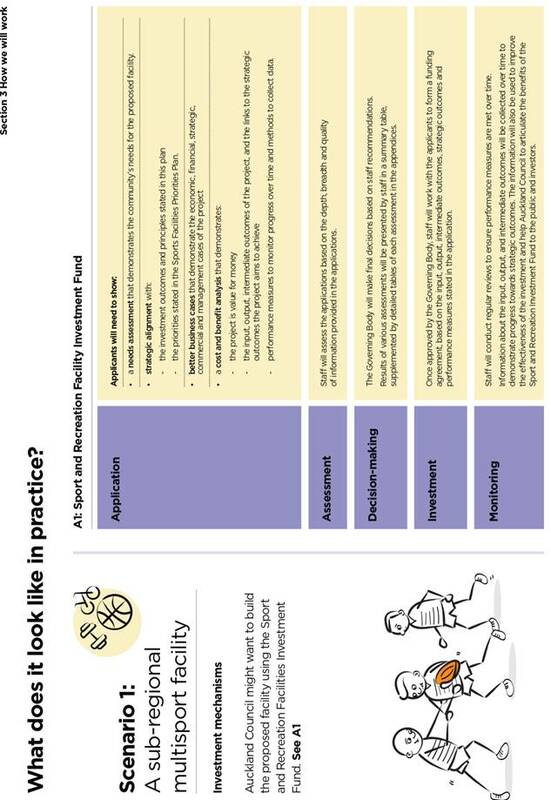 Feedback from local boards was generally supportive of a new investment plan for sports facilities to ensure consistency, efficiency, transparency and outcome delivery. 30. Challenges relating to population growth, land supply and budgetary constraints were highlighted. Local boards also noted challenges specific to their areas and populace. 31. Feedback showed a strong preference to have a flexible approach to accommodate diverse local needs. 32. Staff are seeking to understand local boards’ views on the draft plan and request a formal decision at local boards’ business meetings during February and March 2019. 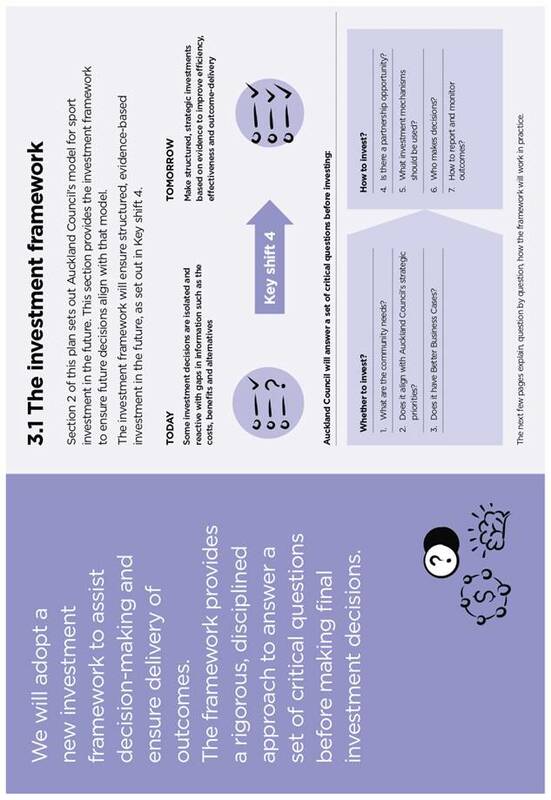 · the proposed investment framework (pages 24-36). 35. According to Sport New Zealand data weekly sport participation of Māori in Auckland (76.8 per cent) is similar to European (76.3 per cent), but higher than Asian (70.7 per cent) and Pasifika (69.1 per cent). 36. 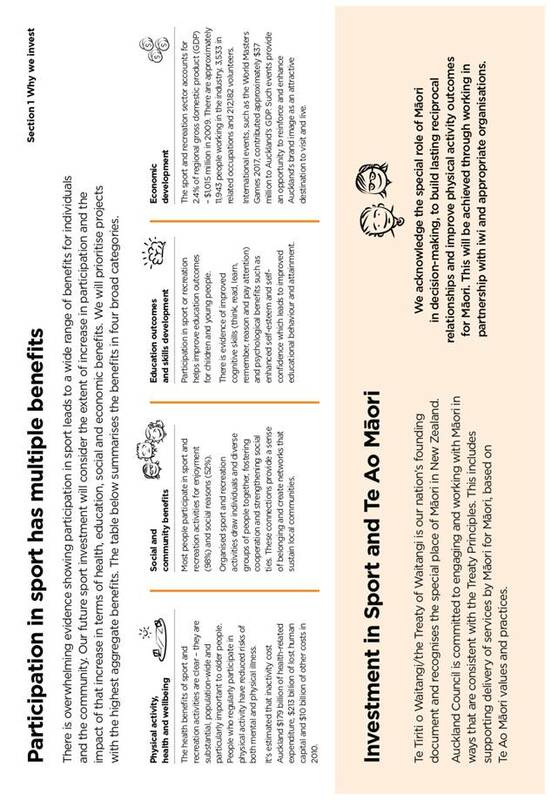 Research also show pockets of sedentary Māori who do not have adequate opportunities to participate in sport. They will be a target group for investment. 37. Feedback from the Mana Whenua Forum and Aktive Māori Advisory Group during public consultation on the discussion document informed the development of the plan. 38. A key area of focus was the delivery of outcomes through increased Māori participation. 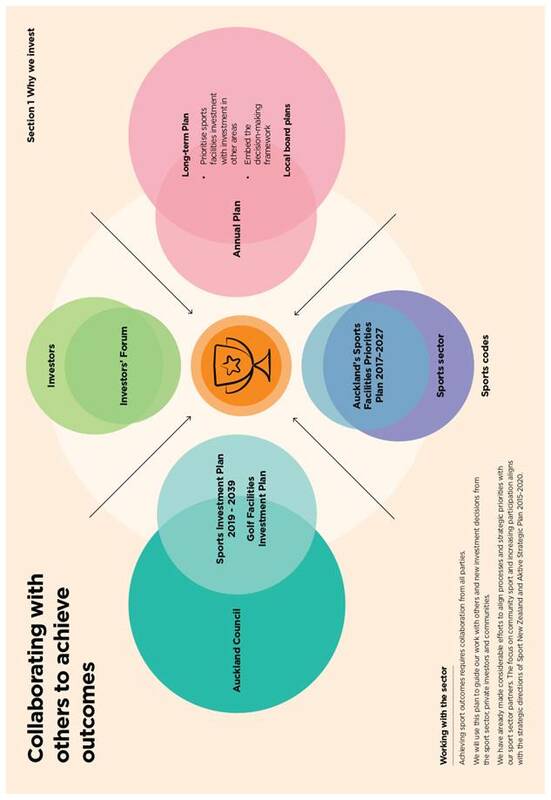 Means of achieving this goal include partnerships with iwi and Māori organisations, to manage demand efficiently and to use sports programmes and facilities as a social hub to strengthen cultural and community connections. 39. 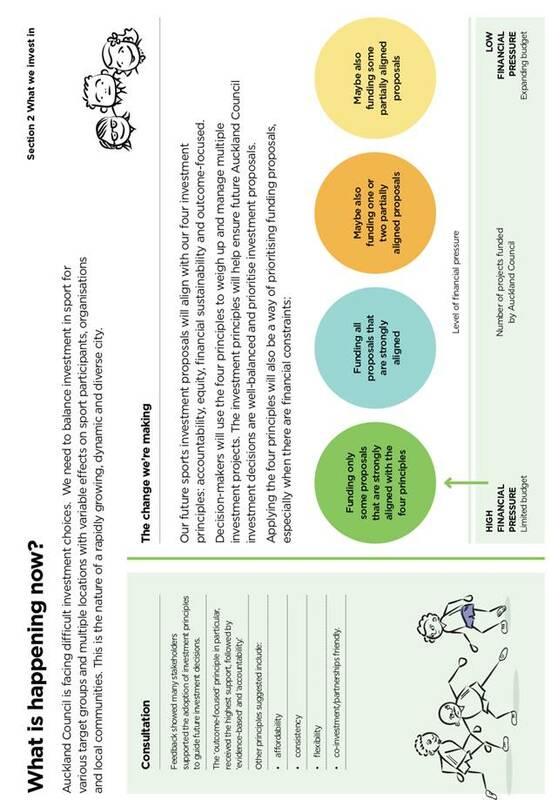 Partnerships will draw on Māori-centric models and collective models of learning so that key Māori concepts become embedded in sport service design and delivery. 40. Staff will seek further feedback from the Mana Whenua Forum and Aktive Māori Advisory Group as part of the consultation on the draft plan. 41. 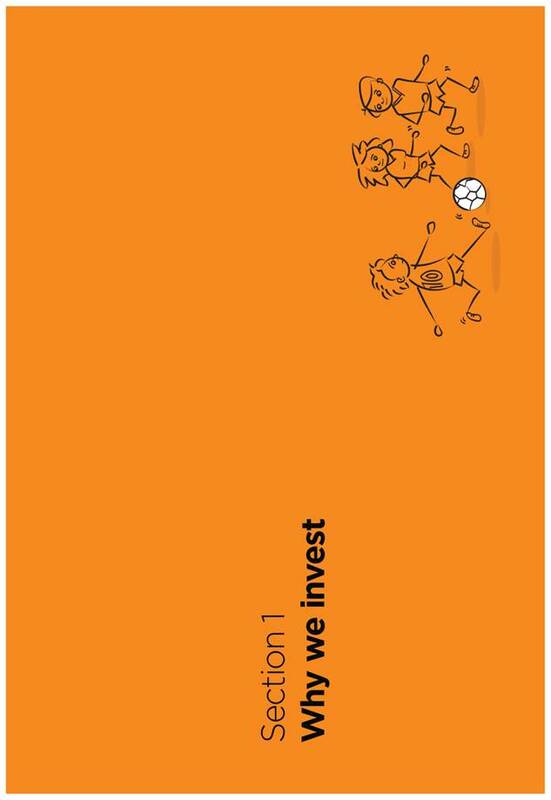 Once adopted, the plan will guide all council investment in sport. 42. An immediate focus will be to establish a clear and contestable process for the allocation of the $120 million Sport and Recreation Facilities Investment Fund established in the Long-term Plan 2018-2028. 43. 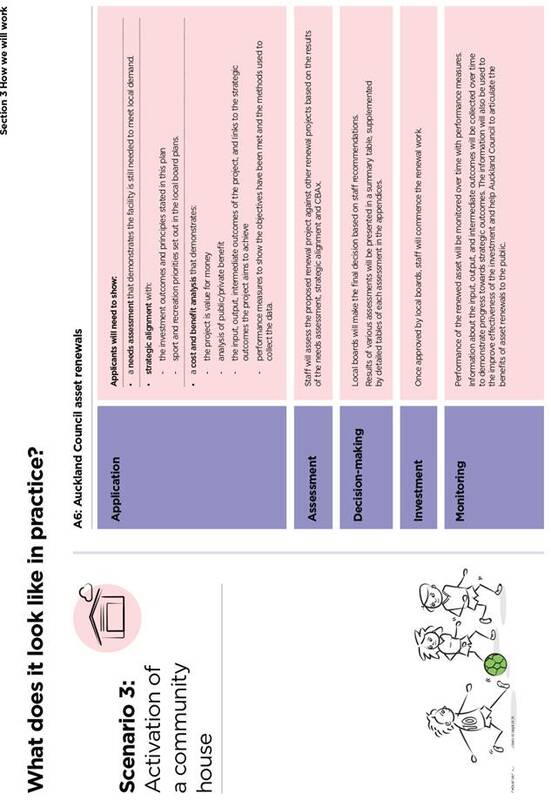 Staff have identified reputational and operational risks associated with the adoption of the draft plan. These risks will be mitigated through regular communication and engagement with key stakeholders. Some people might worry the plan will change arrangements already in place, or ongoing council investment. Clear communication with key stakeholders and funding recipients that the plan will guide decisions on future investment only, unless a current project is already scheduled for review. 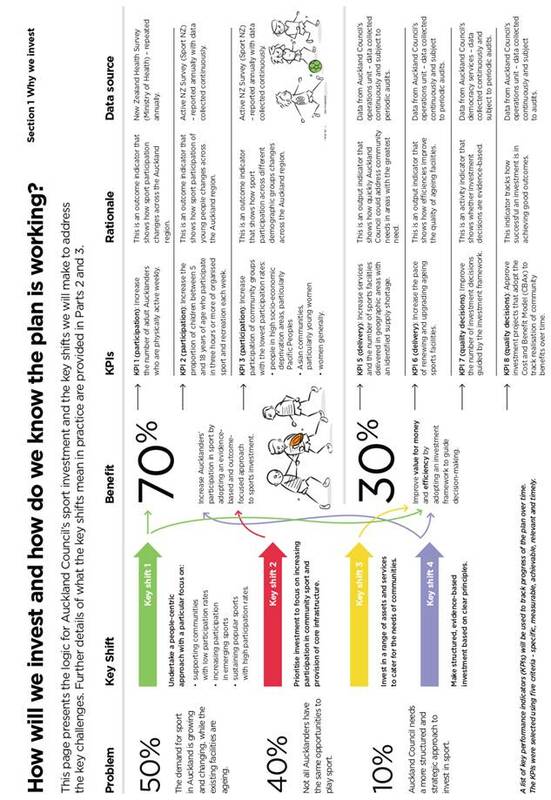 The transition to the new investment approach will be operationally complex. It impacts multiple teams across the council, and new business processes, guidance and forms will need to be designed to support it. Detailed implementation planning will be required to ensure the transition is as smooth as possible. Changes will be phased in over the next three to five years. 44. Staff will undertake public consultation from February to March 2019. · the sport sector will be invited to provide their formal views through Aktive. 46. 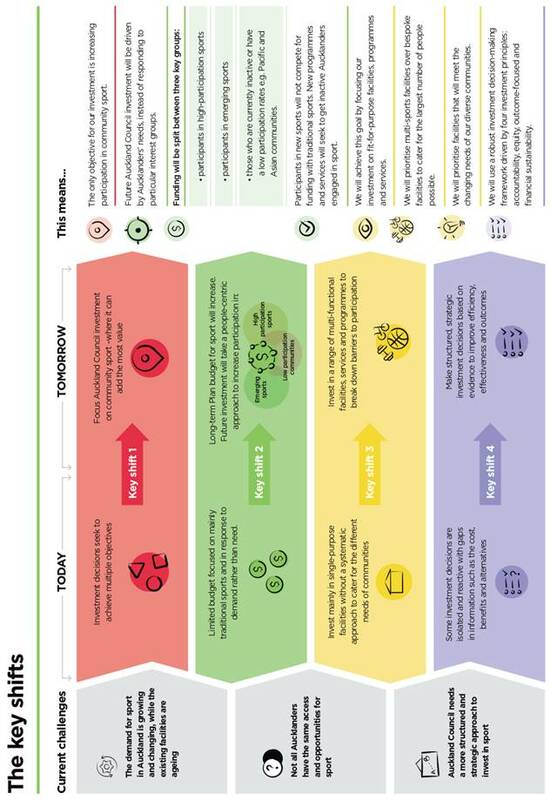 A summary of consultation feedback and a final plan will be prepared for consideration and adoption by the Environment and Community Committee around May 2019. 47. Implementation of the plan will occur in stages over the next three to five years, depending on council budgetary and planning processes. 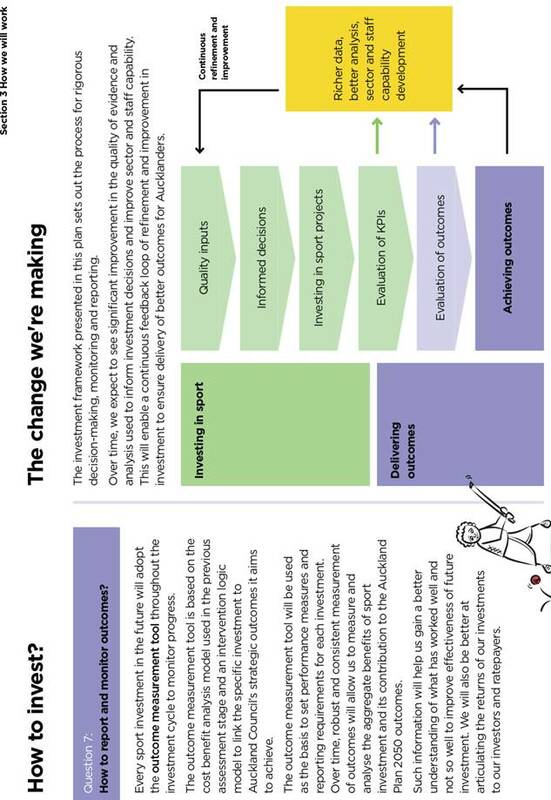 An indicative timeline of the potential changes is presented in section three of the draft plan. 48. 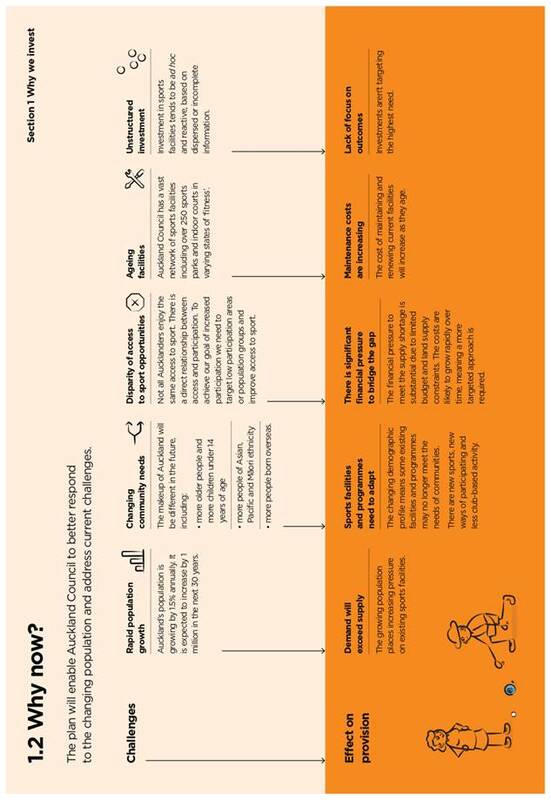 Figure 3 below shows the next steps in a flow chart. 49. 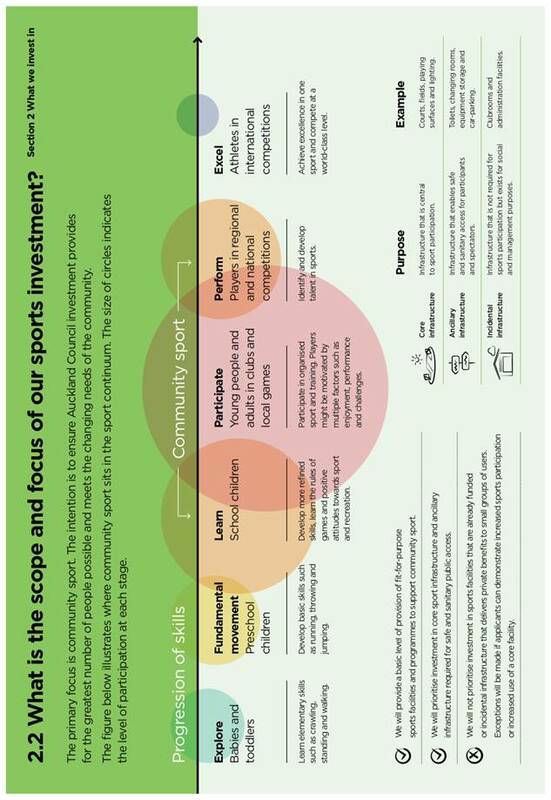 The draft plan sets out an overarching investment framework to help decision-makers prioritise investment between different sports. 50. Separate, but related plans are being developed to guide council’s investment in golf and play facilities. 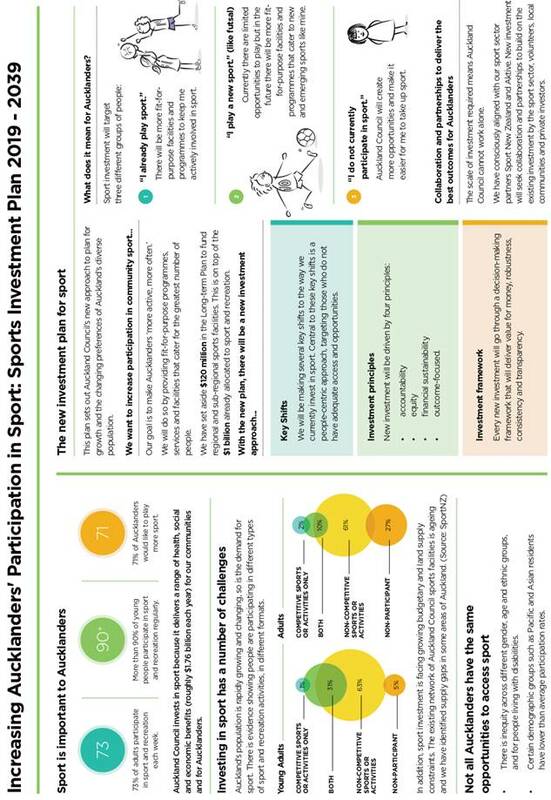 These plans will be consistent with the overarching framework set out in Increasing Aucklanders’ participation in sport: Investment Plan 2019-2039. 1. To seek approval for meeting dates changes to be added to the 2016-2019 Waitākere Local Board meeting schedule. 2. 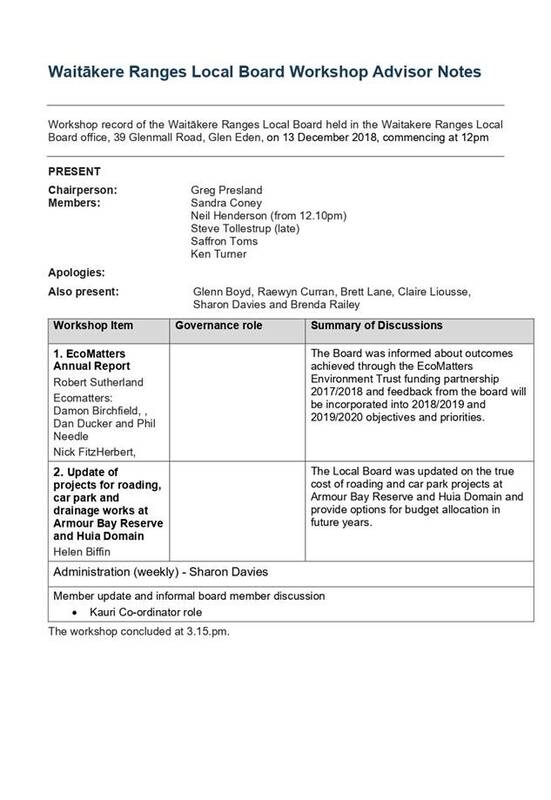 The Waitākere Local Board adopted the 2016-2019 meeting schedule on 24 November 2016 (Resolution WTK/2016/145). 3. 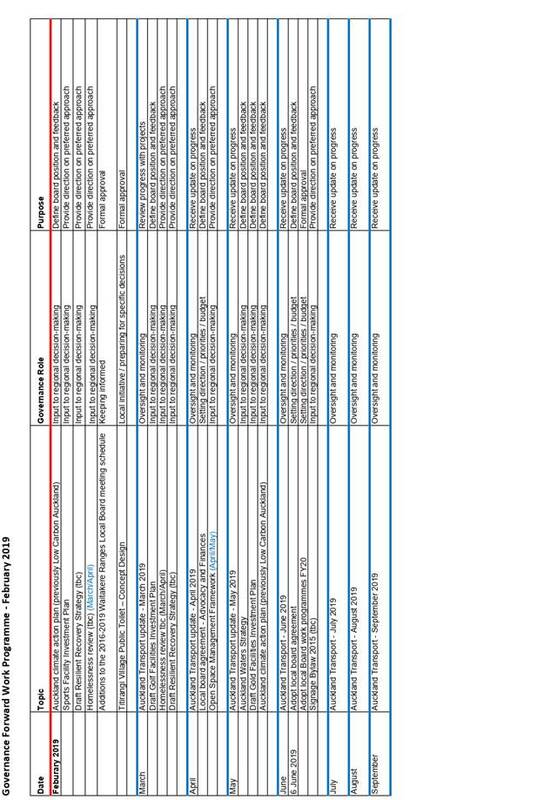 At that time, the specific times and dates for meetings for local board decision making in relation to the local board agreement as part of the Annual Plan 2019/2020 and subsequent changes to the original meeting dates for 2019 were unknown. 4. The board is being asked to approve an additional meeting date so that Annual Plan 2019/2020 timeframes can be met and subsequent changes to the original meeting dates for 2019 to the Waitākere Local Board meeting schedule. · Thursday, 6 June 2019, 10am. 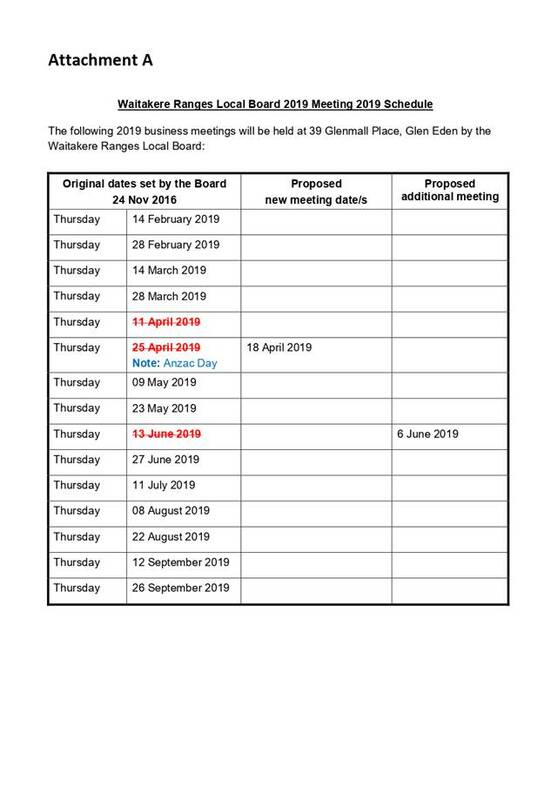 b) approve the changes to the original meeting dates (Resolution WTK/216/145) as outlined in Attachment A.
c) note the venue for meetings will be the Waitākere Local Board, 39 Glenmall Place, Glen Eden. 5. The Local Government Act 2002 (LGA) and the Local Government Official Information and Meetings Act 1987 (LGOIMA) have requirements regarding local board meeting schedules. · clause 19, Schedule 7 of the LGA on general provisions for meetings, which requires the chief executive to give notice in writing to each local board member of the time and place of meetings. Such notification may be provided by the adoption of a schedule of business meetings. · sections 46, 46(A) and 47 in Part 7 of the LGOIMA, which requires that meetings are publicly notified, agendas and reports are available at least two working days before a meeting and that local board meetings are open to the public. 7. 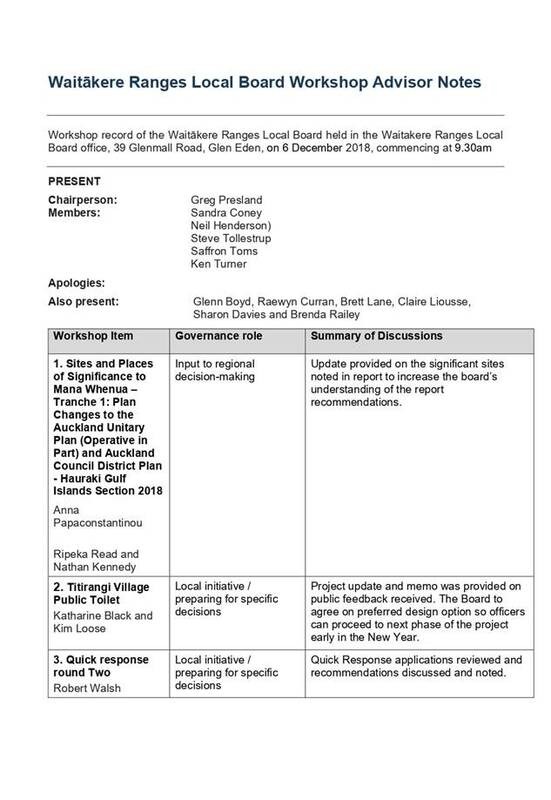 The Waitākere Local Board adopted its business meeting schedule at its 24 November 2016 business meeting (Resolution WTK/2016/145). 8. 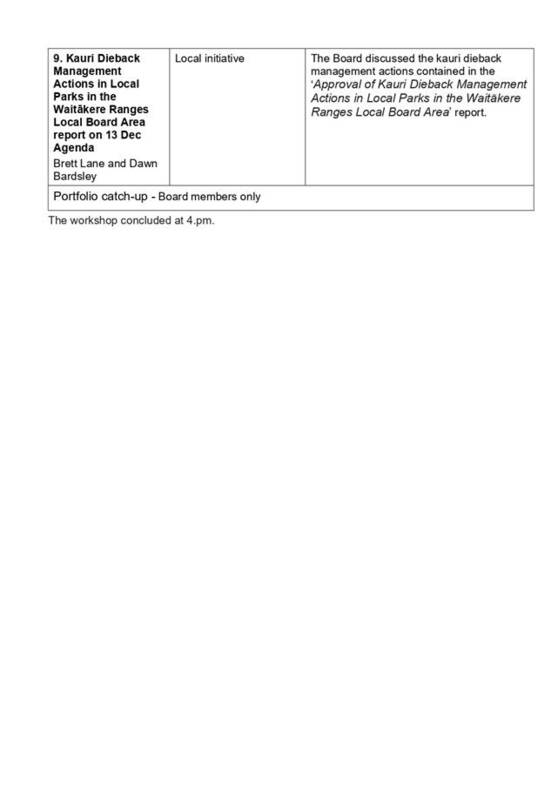 The timeframes for local board decision making in relation to the local board agreement which is part of the Annual Plan 2019/2020 and subsequent changes to the original meeting dates for 2019 were unavailable when the meeting schedule was originally adopted. 9. The board is being asked to make decisions early June to feed into the Annual Plan 2019/2020 process. This timeframes are outside the board’s normal meeting cycle. i) Add the meeting as additions to the meeting schedule. ii) Add the meeting as extraordinary meetings. 11. For option one, statutory requirements allow enough time for these meetings to be scheduled as additions to the meeting schedule and other topics may be considered as per any other ordinary meeting. However there is a risk that if the Annual Plan 2019/2020 timeframes change or the information is not ready for the meeting there would need to be an additional extraordinary meeting scheduled anyway. 12. For option two, only the specific topic Annual Plan 2019/2020 may be considered for which the meeting is being held. 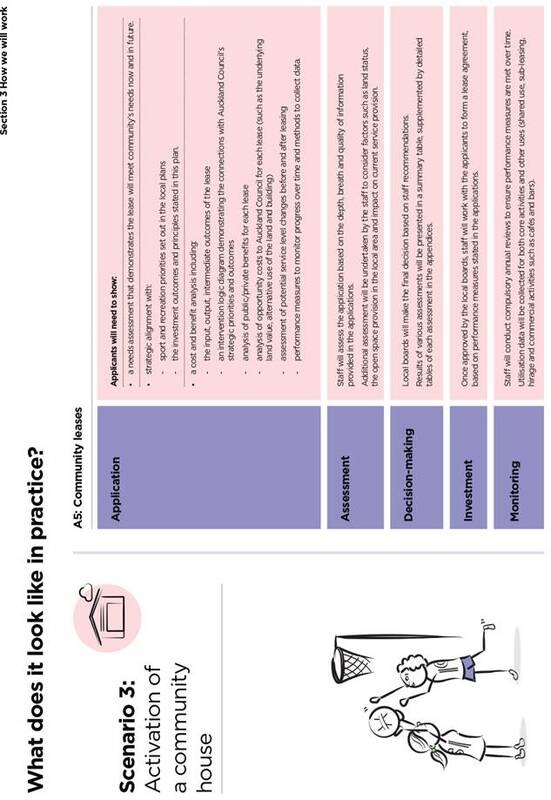 There is a risk that no other policies or plans with similar timeframes or running in relation to the Annual Plan 2019/2020 process could be considered at this meeting. 13. Since there is enough time to meet statutory requirements, staff recommend approving these meetings as an addition to the meeting schedule as it allows more flexibility for the board to consider a range of issues. 14. No council groups will be impacted if the changes to the Waitākere Local Board 2016-2019 meeting schedule are approved. 15. This report requests the board’s decision to schedule an additional meeting and consider whether to approve it as extraordinary meeting or addition to the meeting schedule and subsequent changes to original meeting dates for 2019. 16. There is no specific impact for Māori arising from this report. Local boards work with Māori on projects and initiatives of shared interest. 17. There are no financial implications in relation to this report apart from the standard costs associated with servicing a business meeting. 18. There are no significant risks associated with this report. 19. 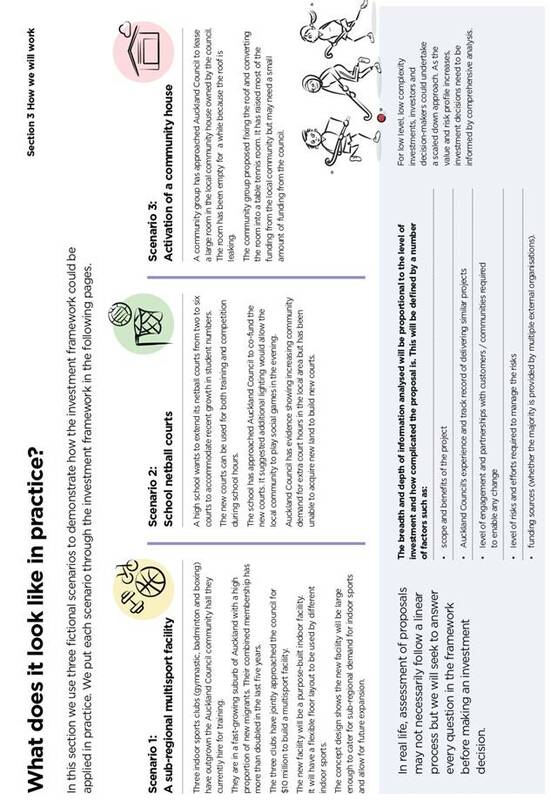 Implement the processes associated with preparing for business meetings. 1. To present records of workshops held in December 2018 by the Waitākere Ranges Local Board. 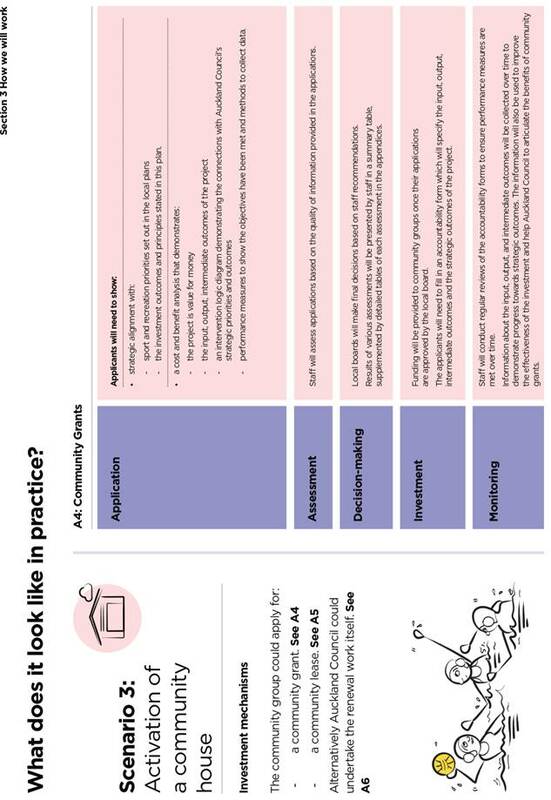 a) receive the workshop records for 6 and 13 December 2018. 1. To present the Waitākere Ranges Local Board with its updated governance forward work programme calendar (the calendar). 2. 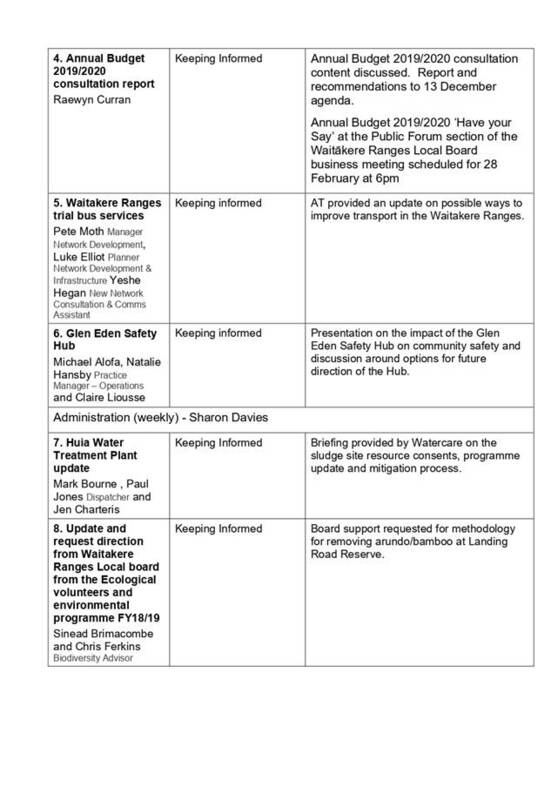 The calendar for the Waitākere Ranges Local Board is in Attachment A. The calendar is updated monthly, reported to business meetings and distributed to council staff. · clarifying the rationale for reports. 4. The calendar also aims to provide guidance for staff supporting local boards and greater transparency for the public. 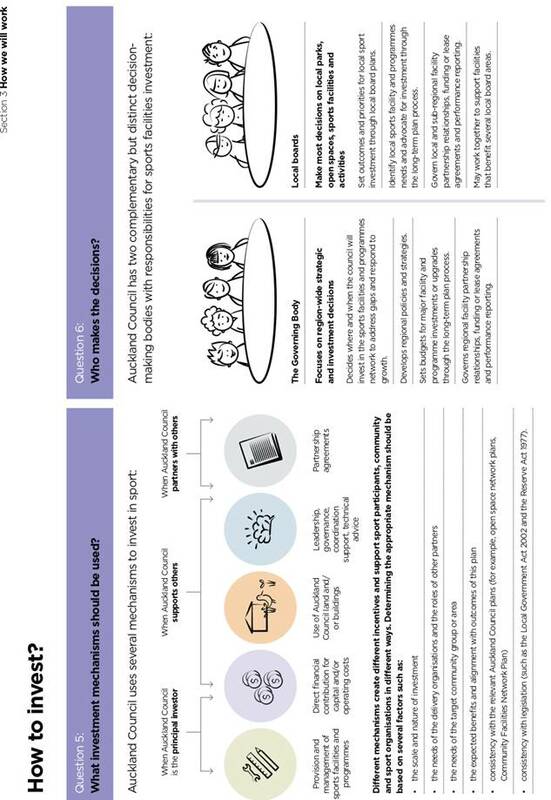 a) receive the governance forward work programme calendar for February 2019.